Facing Google Takeout download failed issue? Read this blog to find the best solution. We have resolved the Google takeout failed problem with the help of Gmail backup Software. Google Takeout is a service provided by the Google that allows exporting Gmail data to a ZIP file. Google Takeout was developed by the data liberation front. With the help of this service, the user can download the backup of Gmail data in ZIP and TGZ file format. But there are some situations in which the user has to face Google takeout download failed problem. So in this article, we will be discussing how to use Google Takeout to back up the data and we will resolve the Google takeout issue by giving a perfect solution to the problem. Before going further let’s discuss them with the help of a scenario. Are You Facing the same problem? While downloading Archive file from Google takeout you are getting the same error message? If Yes then you are on the Right solution page. Going to solution part let us first discuss the How to use Google Takeout to archive Gmail data. In the below-mentioned steps, we have explained how to create a backup of Gmail emails by using Google takeout service. 1. First, the user opens the browser and then Sign in to the Gmail account. 3. Now, select Mails option in the select data to include section and click on Next. 4. Now in the file type option select the file type from ZIP or TGZ. 5. Choose the delivery option, the user can select send a link via email, Add to drive, Add to Dropbox, or Add to one drive. 6. Click on Create archive button. 7. On that page, the user will see two options create another archive and Manage archive. Choose Manage archive option. 8. Click on download button to download the data. The above-discussed method helps to create the archive of Gmail data. But this method has some limitations such that It helps to create the archive file in MBOX file format only. But in order to access the file in Microsoft Outlook email client, the user has to convert it to PST file format. So, in that case, the user can prefer Gmail backup software. Sometimes the user has to face Google Network error when the internet connectivity is lost abruptly. This manual method doesn’t provide any resume option. And due to the user has to face Google takeout Download Failed problem. To overcome the limitations of Manual Method the user can prefer Gmail backup Software. 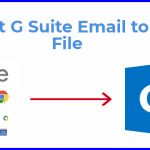 With the help of this software, the user can export Gmail mailbox items such as emails, contacts, calendars and documents in PST / EML / MBOX / MSG file formats. This tool Gives delete after download option to free up server space after downloading the data. The user interface of this software is so simple so that everyone can easily use this software with ease. 2. Now provide the credentials of Gmail account. 3. Choose the File format from PST / EML / MSG / MBOX. 4. Select the file formats emails, contacts, calendar, documents etc. 5. Browse the destination to save the data. 6. Click on start button to export the data. Google takeout method is used to download the data from the Google service. But sometimes the user has to face the error. So from the above write up one can get the ideas about how to solve Google takeout download failed problem. We have discussed the process of how to use the takeout method and its limitations. To overcome the limitations the user can prefer Gmail backup software. What is inverter and how to inverter work? Build your own gaming laptop and Play High Performance Game in your Laptop! !